$10 Shrek Tickets at the Door! Tickets on sale at the door for only $10 each! Bring your family bring your friends! Update and Call for Action – We Are You!! The Joint Budget Committee is working to complete the Legislative version of the Budget, which will then pass into the hands of the big three, the Governor, Senator DeLeon and Assembly Woman Atkins to hammer out the final deal. Our voices have been heard and were raised again during the DS Task Force Committee meeting today, by members of the committee and during the Public Comment section of the meeting. Secretary Dooley, acknowledged the challenges of the Health and Human Services system and lack of identified revenue for our services as a challenge and the Governor has made his proposal and is awaking the budget from the Legislature. We must continue our action; it is time for the big push including the Governor, the Senate Pro Tem and the Speaker to get support for our community. Our community needs stabilization support of all services, so that we can begin the transition being required by the Federal Government by 2019. Therefore, we support the Assembly’s proposed budget increase of 10% over 2 years (we still believe we need the 10% today), with the call for immediate action with the first 5% increase being effective July 1st, 2015 rather than January 1st, 2016. Any delay in providing stabilization funding to community services and regional centers will continue to push the system further over the edge. We need immediate help! We also support the Senate’s proposed trailer bill language to require DDS to report to the Legislature by January 2016 proposed rate and structural reforms to promote a long-term stable system of supports for individuals with developmental disabilities. As well as the Senate’s proposed trailer bill language to require to shift the savings from the closures of Developmental Centers to the Community instead of back into the State’s General Fund. Your actions have been heard, every member who spoke talked of the calls and messages (tweets, facebook, etc) there office has received. We need to continue that messaging, saying we heard them discuss it in committee, but we are watching their actions as it moves forward. Please call or fax a note to the members below or make a post on their facebook page, like other posts that tell our message. Keep spreading the word. You are making a difference. Dreamscape of possibilities… As an artist and a visionary, Tim Conaway has an amazing talent to share. By merely turning pages in the atlas he carries, Tim takes us on a journey as he travels the world through his visionary-art-of-possibilities. 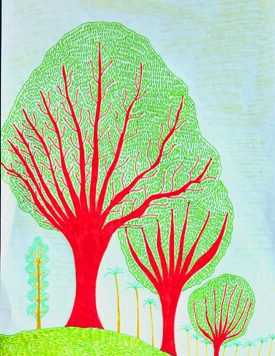 From Kentucky to Alaska, Norway to Madagascar, Tim’s beautiful landscapes are drawn from his unique autistic point of view, in a style that he refers to as “dreamscapes”. Tim has taken a few art classes over the years and was no stranger to the art world. But it wasn’t until he came to St. Madeleine Sophie’s Center that his talent truly evolved. 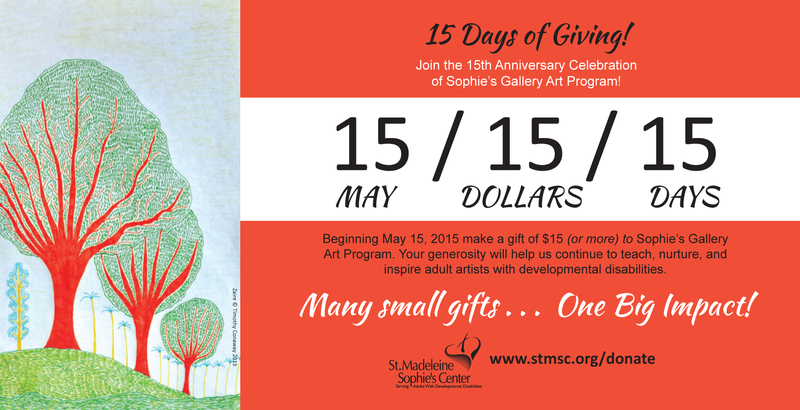 Tim started coming to the Center in 2009 because of Sophie’s Gallery Art Program – an innovative art program that Tim’s family had heard so much about.We are asking YOU to celebrate our 15th year of Sophie’s Gallery Art Program with a gift of $15 (or more). 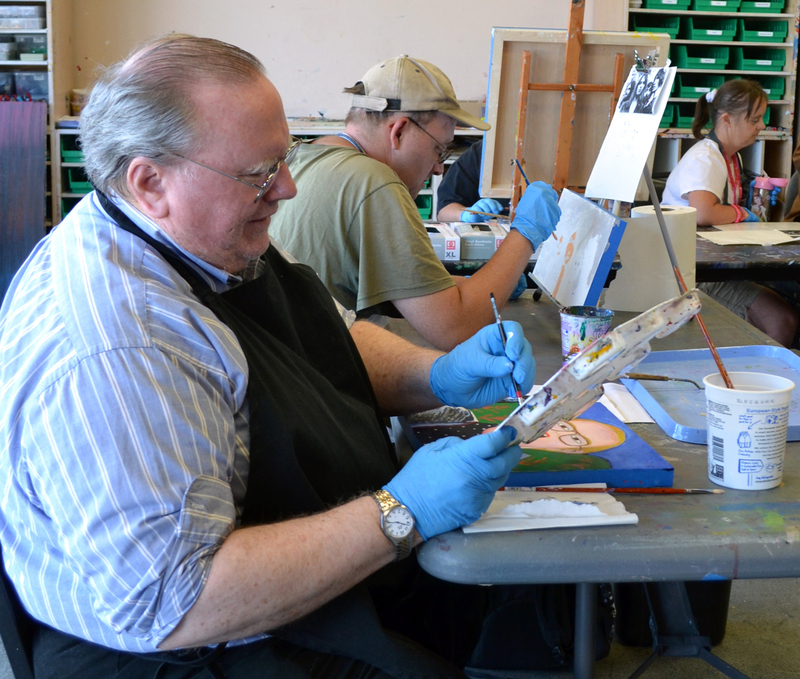 Your generosity will help us continue to teach, nurture, and inspire adult artists with developmental disabilities.